The plans I offer for sale here consist of metric and inch versions of the project drawings in pdf format. I also include CAD files for each individual part, in IGES format*. The digital files are provided to you as a zip file download, immediately upon completion of payment via Paypal or credit card. You will be sent an email with a link to download the files. By purchasing these plans, you are helping me to fund new project video's, and your support is greatly appreciated. ​A classic clockmaking tool first documented more than 65 years ago, this tool would be useful in any home machine shop. Grip those pesky little parts that defy holding, and safely make that cut or hole. Made from the scrap you have at hand, the dimensions and features can be modified accordingly. 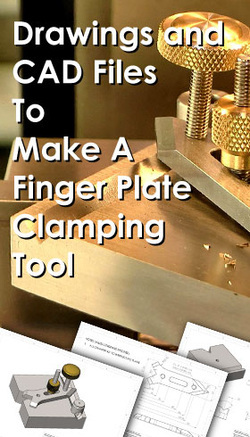 Once you make it, you will wonder how you ever got by without this tool! Watch the construction video here. This is the tool made in Patron Series Project #1. Please note: You can get these plans and all of the build videos for this project as part of the $1 reward level on Patreon, so be sure to check that out if you'd like to help me bring you more videos. Visit https://www.patreon.com/clickspring for more details. ﻿I based the design of this tool on the classic watchmakers screw head polishing tool, whilst also leveraging the structure of the Sherline lathe. It does an excellent job, and makes achieving a screw head black polish with square edges much easier. I made this tool before I started to make videos, but you can see it in action in this video. With plenty of exacting milling, as well as a bit of lathe work and hand finishing, this fun little desktop puzzle is a great home machine shop project. 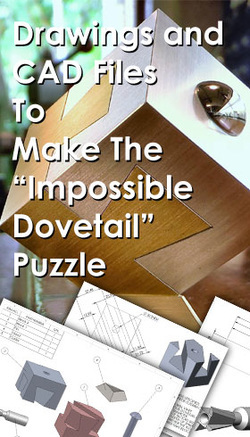 The plans include the details of the specialist dovetail cutter required to do the job, as well as all of the parts of the puzzle. ​Watch the construction video here. If you're looking for a good project that will also double as an excellent gift, then look no further. A terrific mill and lathe project, this one also has the wow factor that commands immediate attention. Watch the 2 part construction video on the Make: magazine channel here. This is a perfect project for a small lathe, and after building it you will have a great little tool to add to your collection of Sherline tail-stock accessories. The tool has a great feel to it, and is made from readily accessible materials. The plans detail all required dimensions to complete the project. Watch the construction video here, and you can also follow along with an Instructible here. 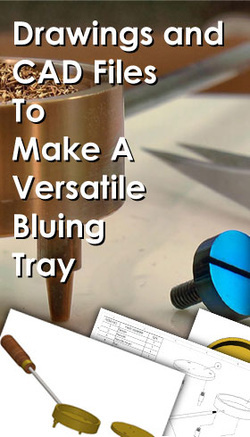 ​A dedicated bluing pan is a must if you blue a lot of small parts like screws etc. There is also a need for a tray filled with brass shavings, for those larger parts. So in this design, I have incorporated both a deep tray and flat tray with holes that share a common handle. ​​This is a classy little lathe dog that is designed to grip thin spigots on parts that are to be turned between centers. A fun project for the mill, with a bit of manual layout and hand finishing with files. Make a set, to cover the range of sizes used in your shop. A must for turning clock pillars. * IGES is a vendor neutral data format, so you should be able to load the CAD files onto your CAD application of choice, and view them. The IGES format does not give the user access to the design tree, so editing or changing of features is not possible. You can learn more about it here. ** Unzip using WinRAR or Winzip.